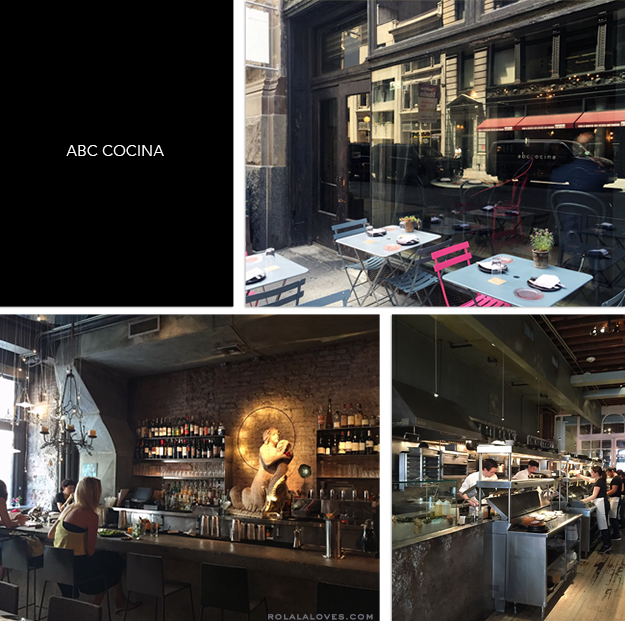 Ever since my impressive dining experience at ABC Kitchen last year, I've also wanted to try Jean-Georges Vongerichten's companion restaurant ABC Cocina. I believe that these two spaces are actually interconnected through ABC Carpet and Home. Nonetheless we made our entry through their 19th Street entrance that offers outdoor seating during the warmer months. The somewhat cavernous feeling dining room with a bustling open kitchen features exposed beam ceilings from which a number of eclectic chandeliers hang. The decor adopts an eco chic modern vibe with concrete walls, black steel tables with black and pink open back chairs that look cool but are quite uncomfortable. The Latin inspired tapas style menu follows the same farm to table market concept of ABC Kitchen with a varied selection of seasonal organic and local sustainable fare. 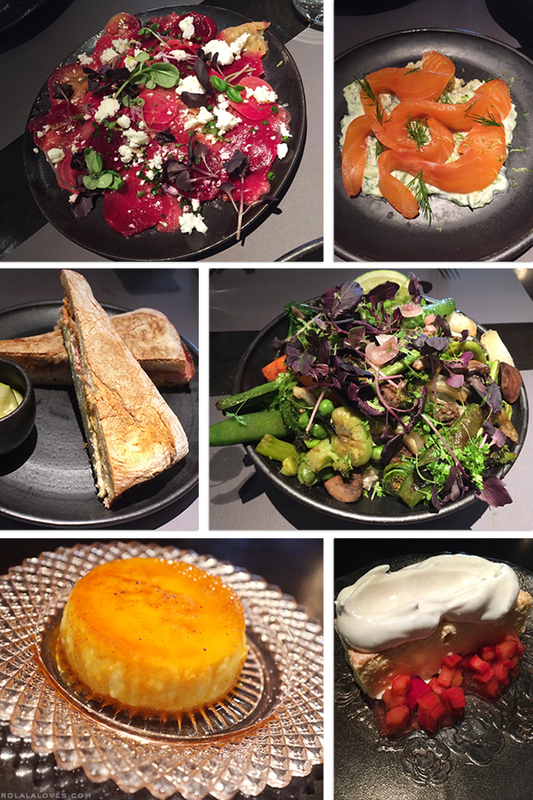 All the dishes we tried were bursting with bright and fresh flavors. Our starters of mezcal cured salmon with cucumber yogurt relish and shaved beets, portobello mushrooms, queso blanco and herbs were impressively flavorful. The market vegetables over brown rice with salsa verde looked gorgeous and tasted equally as incredible. Every element was cooked to perfection and the flavor of each vegetable was as if it had just picked from the garden. I can't say the same for the roasted turkey cuban sandwich which had some crazy kick that burned so intensely that I couldn't spit out the bite I took of it quick enough. My husband didn't have any issues with it though. For dessert we tried their famous salted caramel impossible flan which had the loveliest smooth texture and delicious mingling of vanilla and caramel. The light and creamy tres leches cake didn't disappoint either. I've mentioned before I'm not really one for sweets but I could easily eat a few bites of both of these without getting sick of them. The service was knowledgeable and friendly. Overall I think we may have enjoyed the food here even more than ABC Kitchen and there are some menu items like their spring pea guacamole that I'd love to return to try. The reservation situation is similarly challenging to their sister restaurant but I will mention that it does seem to be easier to score a table during lunch than dinner. Ugh, that flan sounds (&looks) amazing! I feel like flan is only good when done right, and that looks like it was done right! While I do really enjoy your restaurant posts they end up leaving me craving delicious food, which is a problem given that it's almost midnight. Anyway, hope you enjoyed all the food (it certainly sounds like you did!) and can't wait to see where you're headed off to next! The food looks absolutely great and so does the décor. Would definitely eat there if I had the opportunity. Oooh I love the decor, it looks so warm and cozy! The food looks awesome too. That FLAN! A place I need to make reservation for amazing dishes great atmosphere. What a fantastic place to dine...that salmon sounds great...sorry to hear about that sandwich, sometimes they (restorants in general) get to carried with spices, but glad to hear everything else was to your liking. I am reading this post at 7am and holy cow, it's making me so hungry! Sounds like a great restaurant, Rowena and the decor is brilliant! Your hood seriously have such awesome restaurants....sigh....I will go to NYC someday!!!! The atmosphere is absolutely lovely. I'm swooning over that chandelier. Yeah, cuban sandwiches can be spicy. Other than that it sounded superb Rowena! Thanks for this introduction! What an amazing place, love the decor, the food looks delicious, would love to eat there. Happy Monday, Rowena. Hi Rowena, this place looks wonderful. It sounds really good and it looks even better, yum! Everything looks way too amazing. Saving this for if we have a chance to go! That sounds and looks like such a great place sweety! The dishes look delicious. Nice interior as well. Love this restaurant! So good. Oh that Flan sounds amazing, have you ever had the creme brulee at Frankis...to die for! 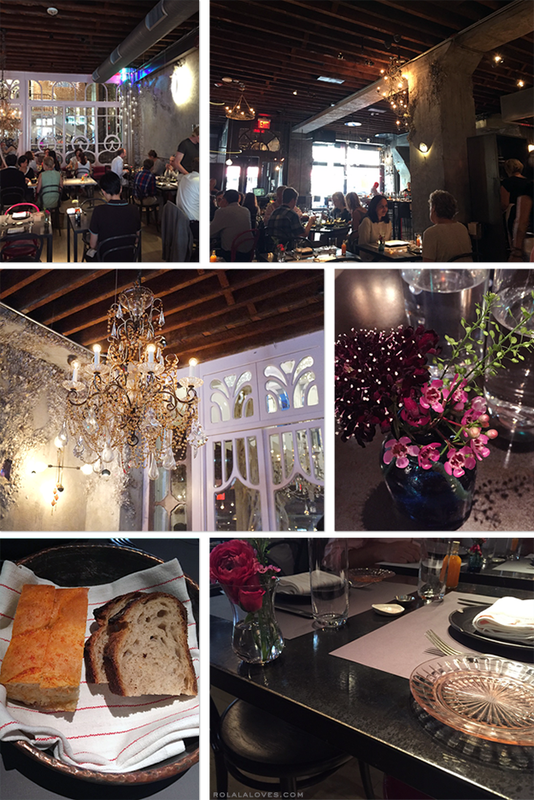 The decor of the place is quite attractive and appetizing dishes are must have been a pleasant experience eating there. Looks like a real trendy spot. I love how fresh the food looks! love the shot of the chandelier against that cool window pane! Fab place to dine out. Yummy food. Omg you had to spit out the sandwich ;-) I always say the hotter the better :D I would love to try it. Glad you had a great time Rowena. The place looks so cool and the food delicious. Hopefully I can try it one day. Have a happy Tuesday! My husband would love the salmon and your Cuban! I think this may need to go on the list for our next visit. Do you have any recommendations for a quiet place with solid food? I like the vibe here and the food looks so fresh and delicious! An open kitchen is so appealing to me and I like the openness of this restaurant. Looks like fun! 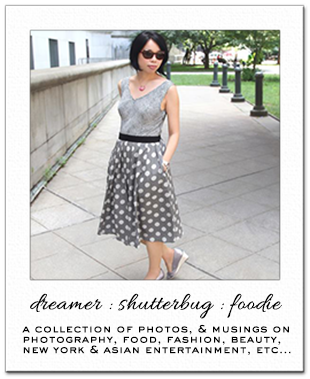 You need to create a NY dining guide Rowena! This is just a stunning restaurant, I don't think I'd even care about the food! Sounds like a lovely place, and the food looks amazing! I shouldn't read this in the morning as i am so hungry right now. Food looks AMAZING. Hmm... the food! So yummy everything, Rowena! And the place looks very cozy too! Perfect for romantic date with the hubby! <3 Happy you enjoyed it, guys!